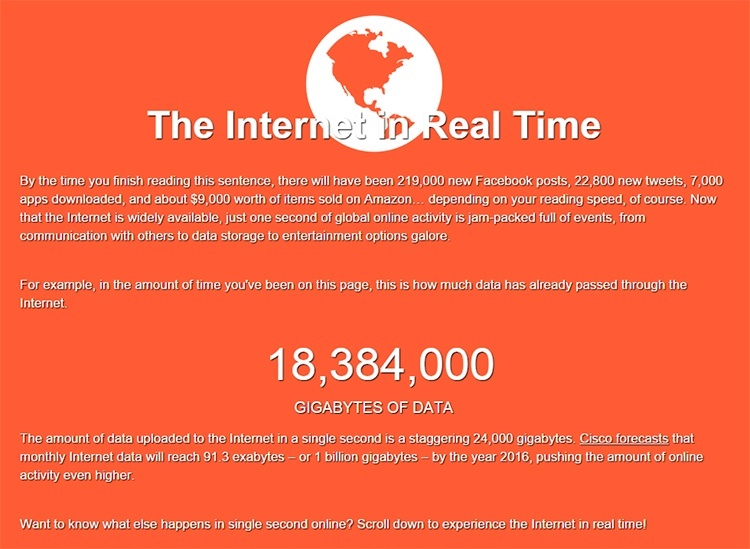 The amount of data that is transmitted in a single second online is simply staggering. Currently, 24,000 gigabytes are uploaded to the Internet each and every second. However, according to a report from Cisco, we could expect to see this number climb higher very soon. By 2016, the amount of monthly Internet data is forecasted to reach 91 exabytes (or 100 billion gigabytes). Wow. At WebFX, we’re fascinated with the Internet and everything in it. That’s why we decided to put together an infographic showing what happens each second on some of your favorite services, including Facebook, Twitter, Instagram, Pandora, reddit, and Yelp. Click here to watch the Internet in real time now! And that’s just the tip of the iceberg. In fact, our research found that for every second that passes, popular music service Pandora streams 532 hours worth of music, and Netflix streams 656 hours worth of video. Thanks to this research, a little programming, and a lot of math, we’ve put together a way for you to watch the Internet happen in real time. In our newest infographic — an interactive piece — you can see the current number of estimated social media posts, media streams, and other online events as they happen around you. The counters will start the moment you open the page, and will accumulate in real time until you close your browser. Ready to watch the Internet happen in real time? Click here to see the infographic now. Have a suggestion for another service or online event you’d like to see us report in real-time? Are you as blown away by seeing these numbers as we were? We’d love to hear your thoughts in the comments below!